Like new condition. 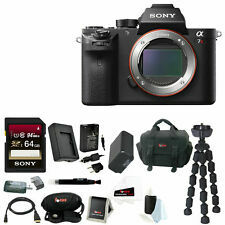 Comes with 2 batteries and 64gb memory card. 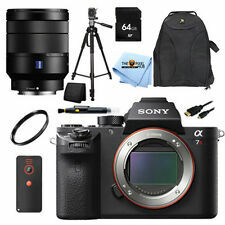 To clarify, this is the A7R2 body and it’s in mint condition. This sensor design both improves low-light operation and speeds up data throughout, enabling fast high-resolution stills and UHD 4K video recording. Composing and reviewing your images as you work is handled with either the 0.5" 2.36M-dot XGA OLED Tru-Finder electronic viewfinder or the 3.0" 1,228.8k-dot tilting LCD monitor. BASIC BUNDLE NEW. This sensor design both improves low-light operation and speeds up data throughout, enabling fast high-resolution stills and UHD 4K video recording. 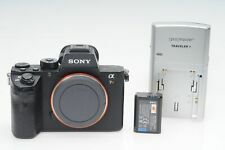 Sony SEL2470Z Vario-Tessar T FE 24-70mm F4 ZA OSS Lens. 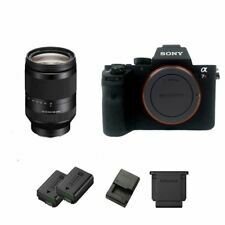 Sony A7R II / 2 Mirrorless DSLR Body. This sensor design both improves low-light operation and speeds up data throughout, enabling fast high-resolution stills and UHD 4K video recording. 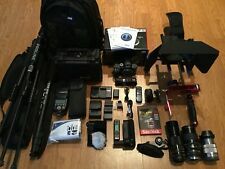 •Sony FE 24-240mm f/3.5-6.3 OSS Lens. 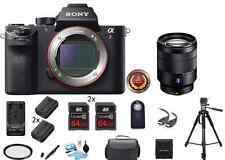 Manufacturer SONY Model Alpha a7R III ILCE-7RM3. Mount Alpha a E-mount. RAW JPEG recording Yes RAW 14bit. Built-in Flash Bulb Mode Yes. Field of View (vertical/horizontal) 100/100. the year when The Who had their Japan tour.